It’s your full (styling) potential, realized. WHAT: A professional, hair-preserving shampoo for fuller, stronger hair. When used as a regimen, it helps reduce hair loss* by 46% in one month. WHY: Infused with our Hair Preserve Blend™, this invigorating, exfoliating cleanser creates an optimal scalp environment by removing sebum and product build-up. The Hair Preserve Blend™ acts like a “liquid bandage” to promote strength and elasticity for thicker-feeling hair. 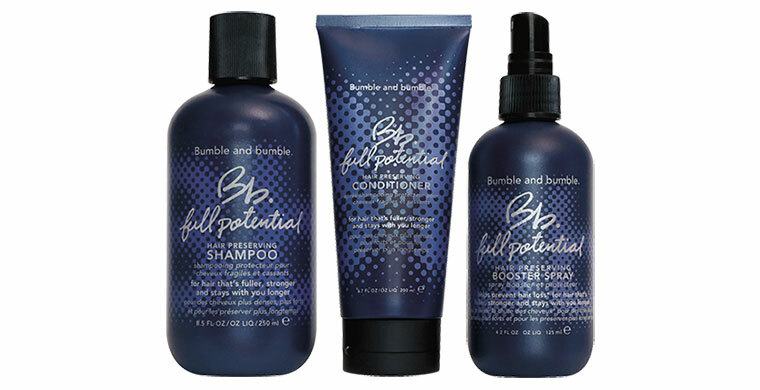 WHO: For anyone who wants fuller, stronger hair – especially those with fine, thinning or breakage-prone locks. HOW: Massage into scalp and hair, lather well and rinse thoroughly. Follow with Full Potential Hair Preserving Conditioner and Booster Spray. WHAT: A professional, hair-preserving conditioner for fuller, stronger hair. When used as a regimen, it helps reduce hair loss* by 46% in one month. WHY: This nurturing, lightweight conditioner is infused with our Hair Preserve Blend™ – and acts like a “liquid bandage” to promote strength and elasticity for thicker-feeling hair. HOW: Work into hair after using Full Potential Hair Preserving Shampoo. Let sit a minute or two, and then rinse. Follow with Full Potential Hair Preserving Booster Spray. WHO: Anyone who wants fuller, stronger hair – especially those who are experiencing hair loss and thinning due to breakage. WHAT: When used with the regimen, this highly potent and restorative Booster Spray helps reduce hair loss* by 46%. HOW: Spray onto wet or dry hair from roots to ends; comb through.